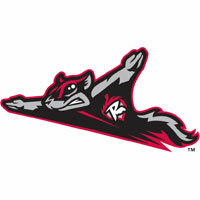 The Flying Squirrels (8-12) scored five runs over the first two innings and held on for a 5-4 victory on Saturday night at Dunkin’ Donuts Park. Slade Heathcott drilled his third home run of the season to provide the difference in the contest. Richmond starter Matt Lujan earned the win with five innings worked and the bullpen triumvirate of Carlos Alvarado, D.J. Snelten and Reyes Mornota struck out seven batters in the final four innings. Moronta closed the door in the ninth to earn his fourth save in as many opportunities. The two teams will play the series finale on Sunday afternoon in Hartford, CT at 1:35 p.m.
Richmond’s offense came to life in the first inning with three runs against Hartford starting pitcher Parker French. With two outs, Miguel Gomez guided a single into center field and Chris Shaw followed by drawing a walk. Dylan Davis then connected on a double off the right field wall to plate Gomez for a 1-0 advantage. Cole continued the inning with a two-run triple off the top of the left field wall to push the Squirrels ahead 3-0. French tossed 28 pitches in the inning. The Squirrels added another pair of runs in the second, beginning with a base hit from Lujan. Slade Heathcott then blasted a two-run homer over the right field wall, nearly clearing the entire stadium to give the Squirrels a 5-0 lead. Hartford quickly began to chip away at the lead and managed a run against Lujan in the second to clip the deficit. 5-1. Josh Fuentes singled with one out and advanced to third base on a base hit to right. Parker French then executed a safety squeeze to produce the run. The Yard Goats delved further into the lead and Lujan in the fourth inning. Drew Weeks opened the frame with a single and Lujan walked next batter Omar Carizales. Josh Fuentes followed with an RBI single and a double steal of second base and home plate produced another run to trim the Richmond lead to 5-3. French lasted four innings and allowed five runs on seven hits in the loss. The righty tossed 67 pitches and was removed for a pinch hitter in the bottom of the fourth. Konnor Wade took over for French and worked three scoreless innings to keep the Yard Goats in an earshot. Lujan navigated through five innings, long enough to earn the win. The lefty allowed four runs on six hits over 93 pitches in his second start of the year. Ryan McMahon plated the final run against Lujan with a towering homer over the right field wall to make it a 5-4 contest. Carlos Alvarado was the first man for Richmond out of the bullpen. The powerful righty struck out a pair in a scoreless inning and turned the ball over to D.J. Snelten for the seventh and eighth. Snelten was nearly untouchable and recorded his 20th consecutive outing without an earned run by striking out four to earn a hold. Reyes Mornota pitched the ninth and stuck out the last two hitters to end the game .